How to use credit to support a healthy financial outlook. Credit is a double-edged sword. Your credit cards allow you to make large purchases, take vacations with the family and shop online. At the same time, using credit cards without a clear plan for managing the debt can put you in severe financial distress. The info below can help you master credit cards to avoid problems. If your cards are already causing issues, we can help. Call us at 1-844-402-3073 to speak with a trained credit counsellor. With so many potential issues, it can be hard to remember that there are some upsides to using credit cards. On the other hand, it’s also vital to remember the downsides so you can protect your finances. You use credit cards for daily purchases because you don’t have enough money in your budget. You use your cards without considering if you can pay the debt back. You use credit to make purchases that you know are outside of your budget, because you really want those items right then. You make impulse buys without thinking because your credit card is handy. You’re in a cycle of using one card to pay the bill on another. You only pay the minimum amounts due on your bills. Not all credit cards are created equal. Understanding the different types of cards available can help you decide on the best card for you. Traditional Credit Cards. These are the most basic type of unsecured credit line available. You can purchase items up to a set credit limit and are charged a standard interest rate based on your credit score. Reward / Point Reward Credit Cards. These give you something back for making purchases, such as points to redeem for things like airline travel, groceries, and even special events. You earn points for purchases and once you reach a certain pint level of points, you can exchange them. 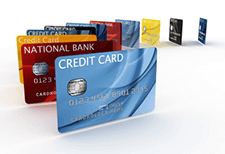 These credit cards will always have higher interest rates than traditional cards! Cash Back Credit Cards. These give you a percentage of cash back for some or all of the purchases you make. You typically receive the money in a lump sum at the end of the year. Like rewards cards, these cards have higher interest. Secured Credit Cards. You can use these to build credit if you have bad credit or no credit. You put down a deposit with the creditor and however much you put into the account (minus fees) is your credit limit. You pay your bill as you would with any other credit card but, if you fail to pay, the money gets deducted out of the deposit and your credit limit is decreased. Annual percentage rate (APR): Cards can have different APR for different types of transactions. Some cards also offer an introductory APR that only applies for a certain time. Also note the penalty APR that may be applied if you pay late, miss a payment, or go over your credit limit. Fees / Finance charges: These include account setup and maintenance fees, charges for additional cards, as well as fees for various types of transactions. Payment schedule: Credit cards get paid back according to a set payment schedule that may differ from one card to the next. Some cards even require the balance to be paid in-full every month. Know how payments are set so you can factor the payments into your budget. Terms for rewards / cash back incentives: Don’t just assume cards with rewards or cash back are better than traditional cards. The incentives may not be worth the extra cost in interest and fees. Do some calculations to make sure you wouldn’t be better off purchasing a reward in cash and using a traditional credit card with a lower interest rate. That last point can be a confusing. This doesn’t mean a creditor calls to tell you when penalty APR has been applied to your account. They are only required to tell you if your APR changes because the reference rate used to calculate it changes; the reference rate is the base interest rate used to calculate APR. Outside of that situation, you may be surprised to look at a bill and see a different APR when didn’t know a new rate would be applied. If more than one rate is listed in your contract, it’s your responsibility to know when and how different rates apply. If you’re having trouble or you need help eliminating your credit card debt, we’re here to help. Call Consolidated Credit at 1-844-402-3073.